The gingerbread house, showcasing the full expanse of the National Mall — the Capitol, the Lincoln Memorial, the Jefferson Memorial, the Washington Monument and the White House — is seen in the State Dining Room during the 2018 Christmas Press Preview at the White House in Washington on Monday. WASHINGTON — The traditional White House gingerbread house isn’t exactly a house this year. It’s a massive, sugary replica of the entire National Mall. 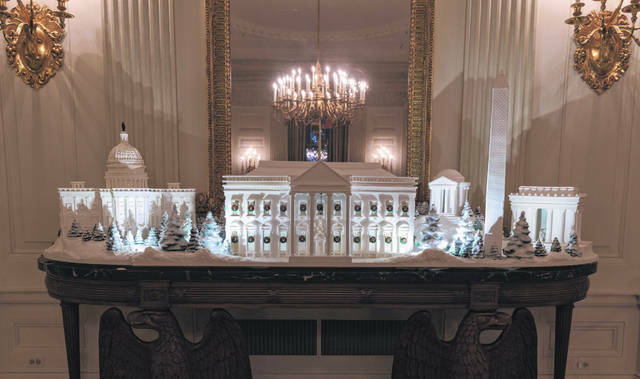 The pastry creation — featured at Monday’s unveiling of the White House holiday decorations — required 225 pounds of dough, 25 pounds of chocolate and 20 pounds of white icing. It includes replicas of the Capitol, the Lincoln and Jefferson memorials, the Washington Monument and the White House, complete with tiny green wreaths with red ribbons on each window. White House pastry chefs have created a gingerbread house during the holidays since the early 1970s. The first one depicted a Christmas village. Another was a replica of President Bill Clinton’s boyhood home in Arkansas. “American Treasures” is the theme of this year’s White House holiday decor, designed by first lady Melania Trump. Four mantelpieces in the ornate East Room feature the skylines of New York, St. Louis, Chicago and San Francisco. In the library, trees are decorated with ornaments from all states and territories. In the China Room, decorators replicated the tables of past state dinners, complete with a place card for President Donald Trump next to one for “Mrs. Macron,” French President Emmanuel Macron’s wife, Brigitte. Upstairs, the 18-foot White House Christmas tree stands tall in the center of the Blue Room. The Fraser fir from North Carolina is decorated with blue velvet ribbon and ornaments from the states. Hidden projectors cast silhouettes of pine and other holiday greenery on the ceilings. The Red Room features ornaments and two wreaths made of pencils stamped with “Be Best,” Mrs. Trump’s initiative that encourages young people to be their best. Tiny white lights and red ornaments, big and small, decorate evergreens through the entire Cross Hall, the colonnade between the East and State Dining rooms. From their portraits on the walls of the corridor, Presidents John F. Kennedy, Jimmy Carter, George H. W. Bush and Ronald Reagan gaze down on the holiday spectacle. Mrs. Trump tweeted a video showing her walking among this year’s holiday decorations.